2. Combine pretzels and pistachios in the container of a small food processor or blender. Pulse until mixture is finely chopped. 3. Combine mayonnaise, mustard, honey and salt in a small bowl. Place salmon fillets on a parchment-lined baking sheet. Spread mayonnaise mixture evenly over the tops of salmon fillets. 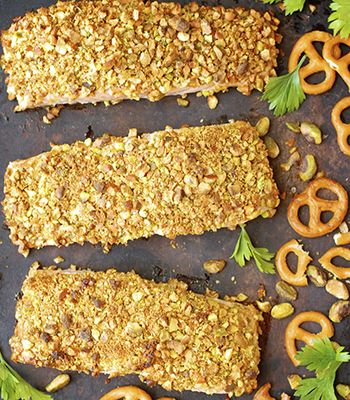 Evenly press pretzel mixture onto tops of salmon to form a crust. 4. Bake at 400° for 15-17 minutes or until salmon is cooked to preferred doneness, and crust is crunchy.